- In a cooking dish, place a sheet of aluminum foil, put the salmon inside, and lift the edges of the foil. Squeeze the juice of an orange inside, and wrap the foil tightly around the salmon to keep the steam in. - Place the cooking dish in the over at 375F for 30 minutes. - Cover half of the serving plate with a bed of arugula. 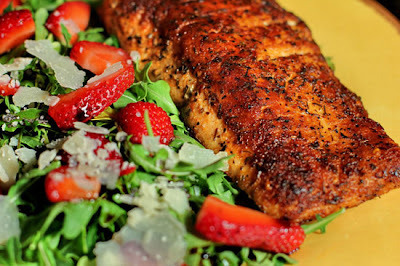 - Sprinkle some good balsamic vinegar over the strawberries and the arugula. - Top with parmesan cheese. - Remove the salmon from the over (when ready), and place on the other side of the plate.